Director Damien Chazelle (Whiplash) delivers a non-musical (!) 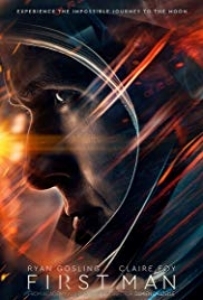 biopic of Neil Armstrong in First Man. Played by Ryan Gosling (Murder by Numbers), Armstrong is, apparently, half-robot, half space hunk. Claire Foy (Season of the Witch) offers a portrayal of Janet Armstrong as Neil’s closed-off, half-robot wife. They are perfect for one another, although you may not know it from seeing this movie. The technical details and production values are stellar.